So what does the above picture show? Well, it’s the typical ‘tip of the iceberg’-scenario. Meaning that hotels may not take noise complaints very seriously because they SEEM infrequent. Or they may compensate those guests who complain without actually doing anything about the noise problems, because they PERCEIVE these as minor issues. But in both cases they are making a serious mistake. Because if only 25% of noise complaints are reported, this means that 75% are invisible, but no less real. Hotels are flirting with disaster if they do not take these figures into account. Why? Because although 75% of noise complaints go unreported, this doesn’t mean these complaints have no repercussions. Nowadays, many travellers don’t bother to report problems to the hotel, but they do leave reviews on sites like Booking.com and TripAdvisor. So if hotel guests have noise complaints, there’s a good chance this will lead to negative hotel reviews. What does this mean? Quite simply that when your hotel has noise issues, this is very likely to lead to multiple negative reviews, fewer recommendations and fewer bookings. More and more travellers base their choice of a hotel on the reviews it receives online, and if they have a choice between two more or less equal hotels of which ones has noise issues, they will choose the other one. 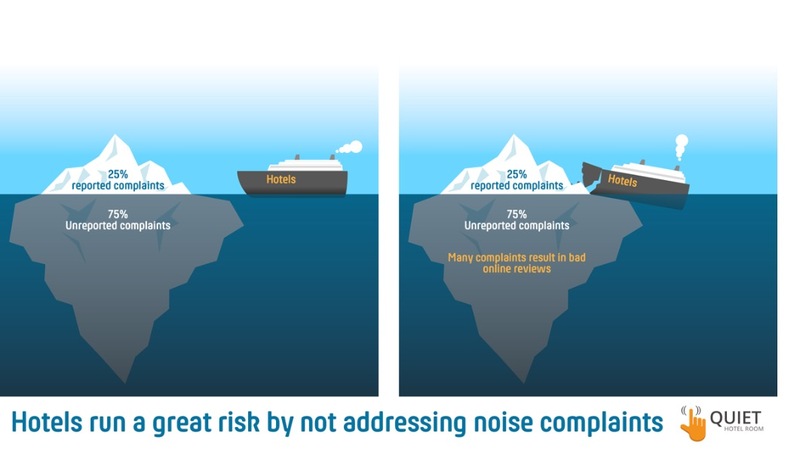 So what should hotels do to avoid the hidden iceberg lurking under the surface and prevent losing bookings because of noise? Once again, take complaints seriously, because there may be many more of them than perceived. Taking noise problems seriously means taking measures to properly soundproof rooms One of the best ways of doing this is through the Quietroom Design&Build turnkey solution offered by the KGI Group. A fast, cost-efficient and effective method of acoustic insulation, which has the added advantage of providing hotels with the Quiet Room label, the one and only objective standard for well-insulated hotel rooms. There are already more than 140 hotels in Europe which have acquired the QR label, among which such prestigious names as Hilton, Golden Tulip/Accor and Swissotel. They use it to show their guests that they can expect a quiet hotel room and it gives them a significant edge over their noisy competitors.